Dustin has been a licensed Realtor® since 2009 and a licensed Broker/Associate since 2012. He also has over 7 years of experience as a real estate investor in both property management and remodeling of homes in Meridian. He has several Realtor® Designations that are recognized by the National Association of Realtors® such as: GRI (Graduate Realtor® Institute), SFR (Short Sales and Foreclosure Resources), and SRS (Seller’s Representative Specialist). 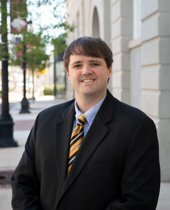 Dustin is actively involved on the local and state level of the Realtor® associations serving both MAR (MS Assoc. of Realtors®) and MBR (Meridian Board of Realtors®) in several capacities. He served as MBR President in 2016.